Big News! My Interview With Kathryn Hansen! This is kind of a big deal. Guess what?! 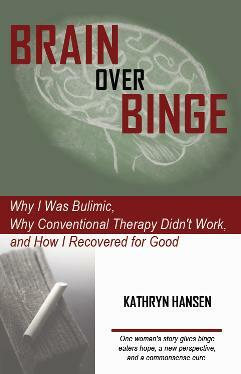 I am getting to interview Kathryn Hansen, writer of "Brain Over Binge." You know, the book that enabled me to bring my years of binge eating & bulimia to a halt. The one who inspired my "Meet Your Brains" video series. The one who totally transformed my life. This is gonna be awesome. We will hear more about her story, her new incredible book, and her insight on what she is a rock star at - helping people quit binging. Interested? And I want to include you too! What do you want to ask her? Submit your questions below and I would love to include them if possible.